The Oasis star performs Live Forever as a tribute to those who died in May 2017 at the BRIT Awards at London's O2. 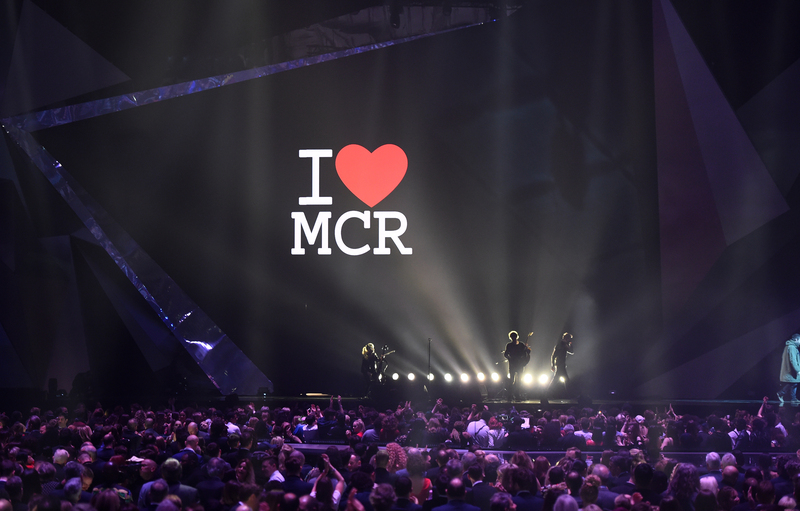 Liam Gallagher performed an emotional version of the Oasis classic Live Forever at tonight’s BRIT Awards in tribute to the victims of last year’s terror attack in Manchester. The star stood in for Ariana Grande, who was originally set to perform at the ceremony, but pulled out at the last moment. The attack, which took place on 22 May last year, saw the Manchester Arena venue bombed following a show by Grande, leaving 22 victims dead, many of them children. The chief executive of the Brit Awards confirmed to Press Association that Ariana Grande pulled out of a surprise performance at the ceremony due to illness. The singer was due to appear in a tribute to the victims of the Manchester Arena bombing but is too unwell to travel. Liam's performance of the 1994 Oasis classic Live Forever - which he famously sang alongside Coldplay's Chris Martin at the One Love Manchester benefit concert that was staged a few weeks later to raise money for those affected - was preceded by a moving introduction by Take That's Gary Barlow. Barlow said: "May 22 2017 will always be remembered for the saddest of reasons. That night, 14,000 people were having a wonderful night watching Ariana Grande perform at the Manchester Arena. These innocent, beautiful, music loving people were blissfully unaware that in just a few moments, their lives would change forever. "A horrific terrorist attack took place, stealing the lives, dreams, and futures of 22 people whilst injuring and maiming hundreds of others. Live changed irreparably, forever. "A few weeks later, Ariana returned to the city to host the One Love Manchester concert, helping the families of the victims and survivors of the tragedy. It was an event that epitomised the human spirit, an event that showed hate will never win, and fear will never divide us. "In a tribute to the people we so sadly lost that day, but who will always live on forever in our hearts, in our minds, and in our memory." Ariana Grande's One Love Manchester concert in June last year saw Liam Gallagher sing Live Forever with Coldplay's Chris Martin for accompaniment. The benefit concert also saw Coldplay lead the crowd in a rendition of Oasis's Don't Look Back In Anger, which had become an anthem of defiance for Manchester.